An eight boat turnout with a bit of breeze for a change, but the fleet was missing the J109's battling for Service honours down in Plymouth. Sunshine, the SOOD set a course of a beat to Quarr off Wooton Creek, a run to Browndown and a kite reach home. The starts with only 8 boats were amalgamated. Spirit of Kudu, Sunshine and Tinker T timing things perfectly charged off the line together with Tinker T just shading it at Darling. The fleet then all tacked off onto a long starboard across the fast flowing west going tide. 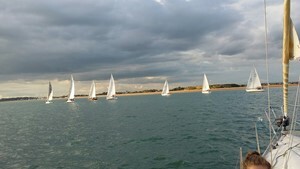 Sunshine as the scratch boat soon found herself in the lead but tonight was not to prove an advantage. Rounding Quarr a few boat lengths ahead of Tinker T setting a spinnaker to run down to Browndown proved impossible with a very large merchant vessel steaming rapidly across the track. Having to wait before taking its stern slowed progress for both the leading yachts with Sunshine the most disadvantaged, allowing the pursuing fleet to rapidly close the gap as they hoisted as soon as they rounded Quarr. Having been rapidly set down tide and needing to sail very deep and slowly neither of the leaders could extend far enough ahead of the pack to hold their time on handicap. The two Sigma 33's and Option all finished close together with Happy Apple and her shiny new keel bolts taking the chocolates on this occasion. Note: The organiser and results compiler is off on his summer hols for the first two Wednesdays of July. ( A bit of sailing in Gibraltar and an amble around Cadiz). I am hopeful that the results for IRC will be calculated by Kit Buck and then forwarded to Heather for displaying on the RNSA website. Alas the NHC results will have to await my return as they are dependant upon having the HAL software and access to the server. Please be patient!